Savings Hero is not an application that should be used to save money and time while shopping online. Even though this adware is marketed this way, you should know that your research team has discovered that in fact it is nothing more than an average adware program. On its official website, this application is advertised as a tool that should provide you with best discount deals and coupons, which should help you reduce the amount of money that you would usually spend online. Such statements are nothing more than a technique used to lure frequent online shoppers into installing this invasive adware application. If, unfortunately, this ad-supported program is already active on your operating system do not hesitate to remove it since it poses not valuable features whatsoever. You should use the removal guide that we provide below to delete Savings Hero in a quick and easy manner. 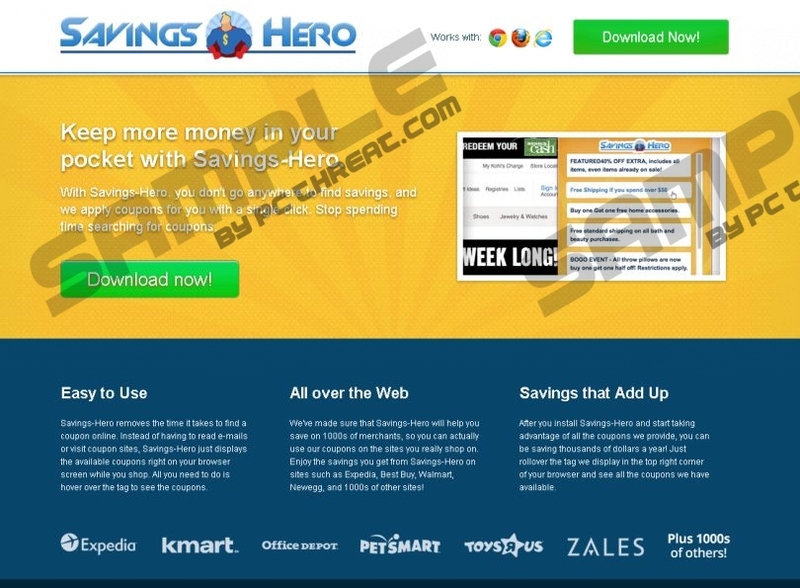 Since it is impossible to download Savings Hero from its official website it is not surprising at all that this adware program is being spread like many of its counterparts – via bundled installers. Such way of distribution is very common nowadays, and you should take a few preventative steps to avoid getting your operating system infected in this manner. We strongly advise you to learn about the application that you are keen on installing as much as it is possible. This is so because it is well known that other suspicious programs use misleading marketing strategies to lure naïve Internet users into installing worthless programs. Another important thing is that you must avoid third-party download website as all time since they are known as a primary source of software bundles. Finally, it goes without saying that a professional antimalware tool is your best bet to keep your operating system safe and secure at all times. While researching it has been discovered that Savings Hero is closely related to adware programs such as ProShopper, Price Slayer, Price-hip and quite a few others. Thus, it is not surprising that the functionality of Savings Hero is very similar to all of its counterparts. Once this adware program enters your operating system, it will install a browser extension that will be used to provide third-party web content. The majority of such content will manifest itself as banner ads and annoying pop-ups. In fact, ads and pop-ups will flood your browser and will make it virtually unusable because you will be forced to fight through those ads and pop-ups every time you browse the web. It is also important to note that all the ads that this adware provides and will not help you with your online shopping in any kind of way. If you wish to restore the standard functionality of your web browser, i.e., stop the invasive activity that this adware imposes you will need to completely remove it. If you are a security conscious user, which wants to keep your system clean and secure at all times, the removal of Savings Hero is imperative. This is so because we have found out that Savings Hero might not be only annoying but could also be used by other Internet-based infection as a gateway to your operating system. This is why the removal of every bit of this adware is important. To achieve that you are advised to remove Savings Hero with a reliable antimalware tool. Right-click Savings Hero and then select Remove. Quick & tested solution for Savings Hero removal.